Offers Over £385,000-Closing Date- Tuesday the 30th of April at 12 noon. 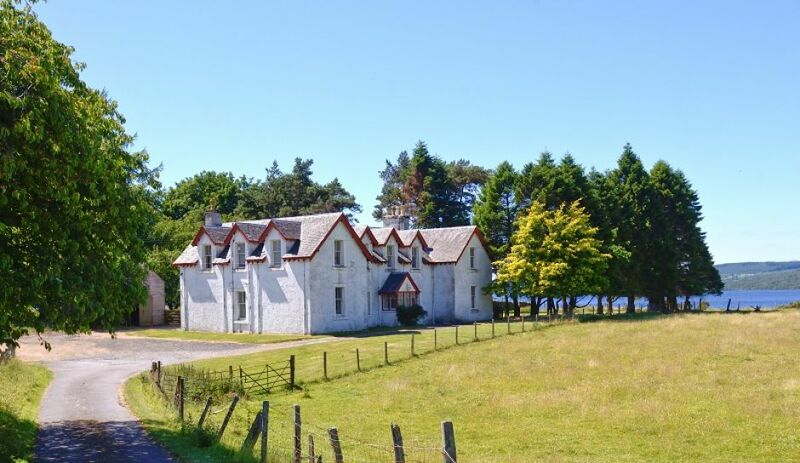 Grand, six-bedroom manse situated in a glorious location on the east side of Loch Rannoch, just outside the charming village of Kinloch Rannoch. With grounds extending to approx. 2.5 acres in total including the Glebe the property offers space and privacy. Whilst in need of some modernisation, the property presents a unique opportunity to live close one of Scotland’s loveliest lochs and the area offers a wealth of opportunities for fishing, boating, canoeing hiking and mountain biking. With six bedrooms and several other rooms offering flexible accommodation, and situated in the heart of a very popular area for visitors this property has potential to form an excellent guest house, or could provide a large country home for a family. There are wonderful views over Loch Rannoch from many windows and the outlook to the northeast is over the Glebe to the hills beyond. Set in the beautiful countryside of Highland Perthshire, Kinloch Rannoch offers a local store with Post Office, gift shop and café. There is also a medical centre and local primary school. A wider range of services can be found in the nearby towns of Aberfeldy (15 miles) and Pitlochry (22 miles). The Central Belt is relatively easily reached by a drive of around 2 hours.